Mom, the Intern: The dress. Let's talk about this amazing dress, shall we? No, I didn't stay up to watch the Royal Wedding, but I'm a good Googler. 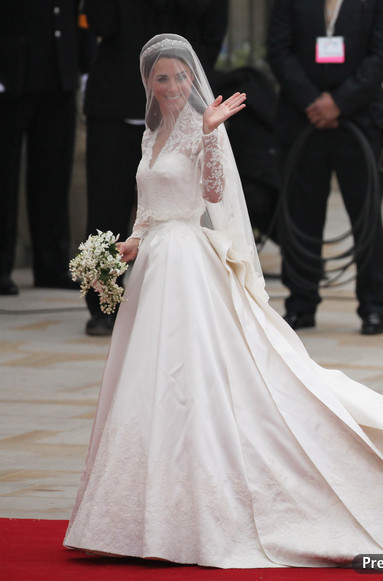 I think Princess Kate looked perfect. What say ye? She looked amazing! I loved her dress. So simple and elegant, and just perfect. I love her dress. Very classy and beautiful. I thought it was perfect! Did you see her sister's, though? HOT DAMN! It was amazing! I loved it! I also loved Pippa's dress. I think if I were to get married in one of them, it would have been Pippa's. Everyone was so gorgeous though! And those hats? Gah, I'm blushing. I loved it all. I have is all dvr'd so I can watch it later. Elegant, classy, and definitely not overdone - understated in the best possible way. Oh but the hats...oh my! I've never seen such strange headpieces! I know I am in the minority here but while I liked the dress, I was a tad disappointed with the whole look. I wish she would have done something different with her hair, she looked the same as she always does. The dress was quite lovely though. I loved it. I loved Pippa's the most though. I dvr'd it and am currently enjoying wishing i was a princess.